Hey there and Happy Tuesday! Life is back in full swing even though we are still cleaning up stuff from our lovely twister! I can't beleive that the kids have only 7 school days left! It all went by so fast! Taryn, my youngest will be graduating Kindergarten! Where does the time go?? Did I mention my Mom is flying in?? So I am sure with EVERYTHING that I need to get done it is all going to fly right by! This week at Stamp Ink Paper we have a really interesting color combo! I say interesting because I wasn't quite sure how I was going to pull it all together.... But I did and I can't wait show you what I came up with! Click Here For Full Challenge Details! So this card is a great combination of two brands! Timeless Textures made its debut in the Stampin' Up! Spring Occasions catalog! I bought it for the coffee rings but the more that I experiment with it I love it! So the Pool Party ink was stamped using Timeless Textures, I then used the dots from the same set with Calypso Coral ink and of course the rings had to be Chocolate Chip! The little splatters were also stamped using Chocolate Chip ink they added some balance! The "awesome" coffee cup with heart shaped steam comes by way of Sugar Pea Designs. This great set has coordinating dies that are just amazing and cut the cup right out! 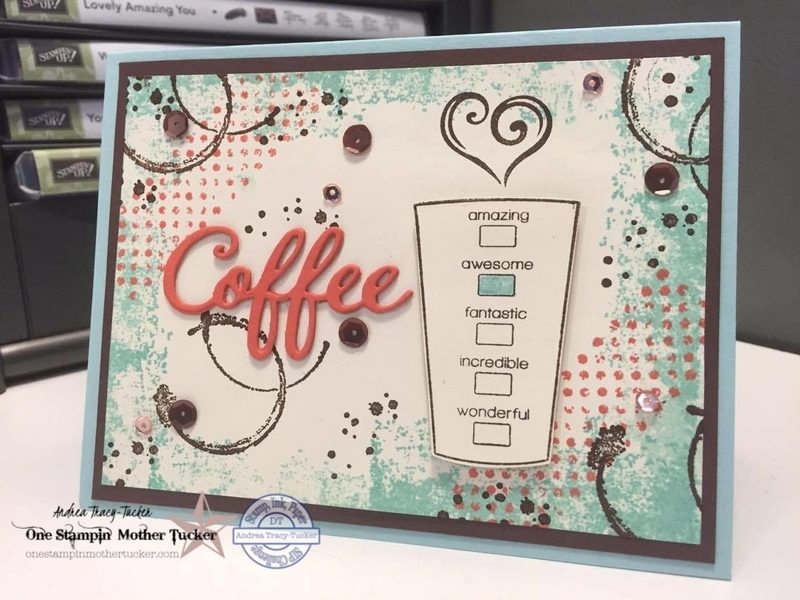 My "Coffee" sentiment is also in this die collection. I cut it three times out of Calypso Coral card stock and glued them all together so that it had some dimension! To finish this fabulous card off I adhered some Rose Gold and Espresso sequins from Pretty Pink Posh! Now that I have inspired you... Go make a card! I can't wait to see what you come up with! I Love this card. I even ordered the stamp set. The dies are out of stock right now, but thank you for sharing your card. Beautiful. Thanks for the idea of how to use them stamps. Love the colors. this is fabulous!!! Love the design woman! !